This “crab grass” is a popular crab-spinach dip. Photo courtesy Miller’s Select Crabmeat. Enjoy these crab recipes courtesy of Miller’s Select Premium Crab. Read our review of Miller’s Select. This is Page 8 of a 10-page article. Click on the black links below to visit other recipes. 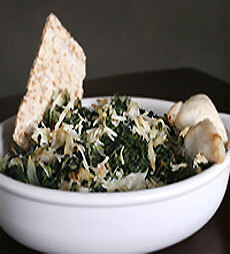 This crab dip is the kind of “crab grass” everyone enjoys—the ever popular spinach-crab dip. Thaw the spinach and squeeze out the excess moisture. Melt the butter over a medium heat and sauté the onions until they become translucent. Add the spinach and stir until heated through. Add the crab and Parmesan and blend into the mixture. Spread into one-quart casserole dish and bake for 15 minutes. Serve with crackers or rounds of French bread.